Yesterday turned out to be a great day. It started off with going to get my blood drawn for Fridays Dr appt. Then Lori and I took our son to his Dr appt, which was clear across town. His appt went well and his Dr wants him to start running, exercise and build some muscle. When we left the Dr. we got a call from Chad and Julie and they both took the day off work and were running around, so we agreed to meet up for lunch. We drove about 30 miles to meet up with them and had a great lunch and conversations. When we finished lunch, Lori, Nicholas, and I headed to Roadrunner Sports to look at new shoes. Nicholas got a new pair (that is now wrapped for a Christmas present), and I picked out my next pair of Asics which I will buy on Friday (payday) and wrap them up for a Christmas present to myself. When we got done there, I had plans to go to REI sports, since they have rock climbing gear there and my son really loves rock climbing. We went there and I told him to look around and Lori and I would be looking ourselves. We found him in the rock section, trying on new climbing shoes. He also got fitted for a new harness and rigging's. I will have to return and get some more Christmas presents for him. I picked up my copy of Fixing your Feet, and then we went to pick up our other son who was in school. We got home and I grabbed my bag and headed to the gym for a good interval run. Headed home and showered and ate dinner with the family. 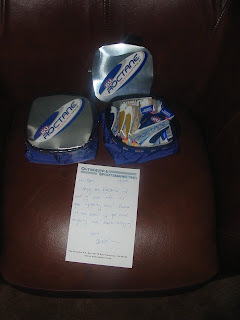 I got an email from OutsidePR and Sports Marketing and they came across my blog and was interested in sending me some Gu Roctane to try out, well the sent me two display cases full of the stuff. Just in time for Across The Years and my long run this weekend. I will give some feedback to them and you as to my liking of the product. Two cases! Wow! Very cool. Those might just come in handy for you. It does sound like you guys had a great day. you'll have to post what you think about that book. I'm having some heel issues these days. Sweet deal you got, unless it was Nasty like Lisa said. Cool! Nice job on your intervals! How nice that you get to try things out!